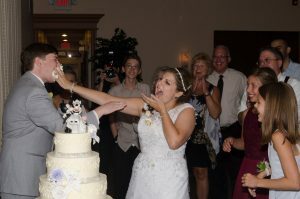 Diane is a wedding cake genius and my go-to for any and all celebrations that require cake! She nailed our #RoseAllDay wedding cake concept, a work of art—modern, chic, unique, SPECTACULAR! 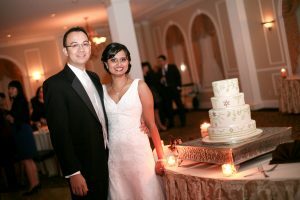 And the topper was that guests couldn’t get enough of its decadent flavors – wedding consensus: best cake they ever tasted!! Diane is truly an artist. She went above and beyond to create a perfect masterpiece for our wedding cake, and we couldn’t have been happier with the results. Not only was the cake beautiful and fun, but it was also insanely delicious. She did 3 different layers of flavors: 2 layers of chocolate cake with hazelnut buttercream, 1 layer of vanilla cake with vanilla buttercream, and 1 layer of vanilla chip cake with vanilla buttercream. We even saved the top layer for an entire year, and had it on our anniversary. 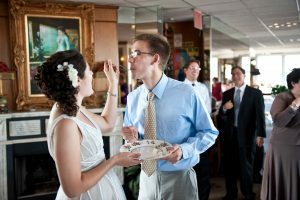 It was just as delicious as it was on the day of our wedding! 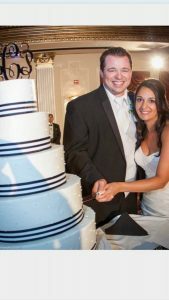 To this day, people are STILL talking about our amazing wedding cake. 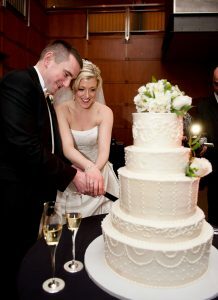 We can’t thank Diane enough for her talent, professionalism and true personal touches to our cake. We are looking forward to having more of her cakes for future birthdays and anniversaries. 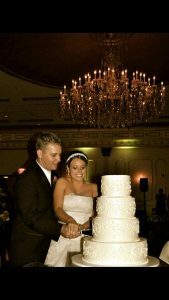 When Diane made the cake for our wedding, I knew that I could trust her vision to create something that was not only beautiful, but delicious as well. I am lucky enough to call Diane my best friend, and as the maid of honor at my wedding, she had free creative reign for the cake. 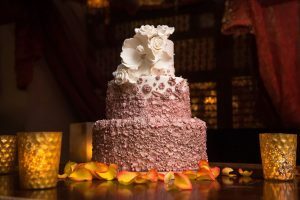 She took my vision of what the general feel of the wedding was going to be, and crafted a cake that was stunning and didn’t sacrifice anything for taste. 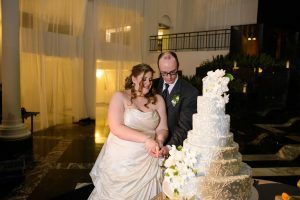 I actually didn’t see the design of my cake until I walked into my reception – and promptly gasped in delight. I had shown Diane a few inspiration photos, but I wanted her to have the freedom to be creative, and I trusted her skills completely. 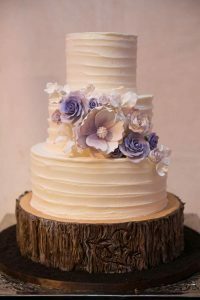 The result was the classically beautiful cake I had dreamed of – and it tasted even better than it looked! 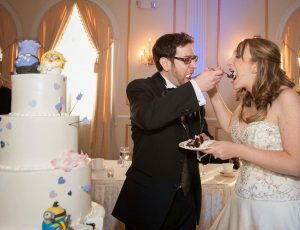 We were beyond thrilled with our wedding cake! The bottom layer looked exactly like a slice of wood and the top was simply gorgeous. It was the perfect combination of elegant and rustic, which was exactly what we were looking for at our camp wedding. Best Cake Ever. THANK YOU! Our wedding cake was amazing! Diane totally understood our vision and made it a reality. From the tasting to the final product, everything was perfect and delicious. When talking to Diane about designing our wedding cake, my only requirement was to incorporate the design of my wedding necklace into the cake. Diane’s design was absolutely beautiful and original. The chocolate cake and pistachio butter cream was delicious! Our guest STILL talk about our cake and it’s been 7 years! Diane Fehder not only made the cake for my daughter’s wedding but she made a beautiful custom designed cake for the bridal shower and a groom’s cake as well. Each one perfectly highlighted their personalities and the most amazing thing is that they tasted just as good as they looked! On top of everything else, Diane is such a pleasure to work with! 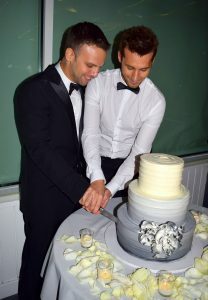 We loved our wedding cake. We left the design up to Diane and she surprised us with the most beautiful flower made of sugar. However, the best part was the taste. The lemon cake with raspberry jam was perfect for a summer brunch wedding. 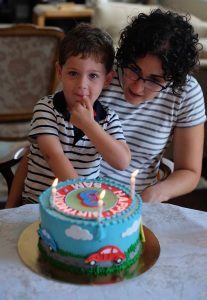 Our son Sam turned three and has finally begun to understand the idea of a birthday party. The car cake made him so happy. He even ate the fondant cars.